A pair of suicide bombings today struck near the Iranian Embassy in Lebanon, the latest violence in a country where concerns have run high about Iran’s influence and the spillover of violence from the civil war in Syria. About seven-in-ten (68%) people in Lebanon said that they were very concerned the violence in Syria would spread to their country, and another 27% were somewhat concerned, according to a Pew Research Center survey last March. Those fears of spreading violence were shared by six-in-ten or more Lebanese Shia and Sunni Muslims, who often find themselves in conflict. Iran and its Lebanese ally Hezbollah, who are both Shia powers in the region, have openly supported Syrian President Bashar Assad in his country’s civil war. Hezbollah’s leader, Sayyed Hassan Nasrallah, said last week that his group would keep fighting in Syria as long as necessary. A group linked to al Qaeda, the Abdullah Azzam Brigades, claimed credit for the bombings and promised more unless Iran pulls back its support for Syria. The brigades are a Sunni group. The rebels fighting Assad draw much of their support from Sunnis and Sunni-dominated countries in the region. An overwhelming majority of Lebanese (85%) say that Iran has a great deal or fair amount of influence in their country, a far higher percentage than any of the six Middle Eastern and North African countries surveyed in March of this year. The sectarian split in views of Iran are illustrated by the fact that 87% of Lebanese Shia who think Iran has a major influence in their country see it as a positive, while 91% of Sunnis regard it as a bad thing. 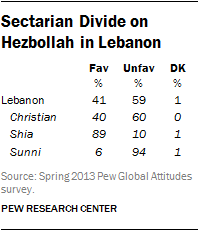 The sectarian divide is also apparent in views of Hezbollah. Overall, Lebanese see Hezbollah unfavorably by a 59% to 41% margin, but 89% of Shia in Lebanon see Hezbollah in a positive light compared with just 6% of Sunnis.